Batman: Skull unearthed from the grave by Black Hand. " --No one escapes death. That includes you. The dead will rise. And you are connected to them all." Coast City: Green Lanterns Hal Jordan, John Stewart, Kyle Rayner, and Guy Gardner performed for the crowds at a heretofore unmentioned memorial holiday for deceased super-heroes. Smallville: Clark Kent, his Ma, and Connor Kent mourned Pa.
Pittsburgh: Professor Martin Stein, Jason Rusch and Gehenna visited the grave of Ronnie Raymond. San Francisco: The Teen Titans mourned their dead. Central City: The secret graveyard of super-villains was seen to by the Rogues. Chicago: Ted Kord was missed. Metropolis: More of the same with the JSA. Amnesty Bay: Two men named Arthur Curry once lived and died here. Mera and Tempest remembered them. Garth argued that Aquaman should have been buried in an Atlantean tomb, but the hero's mercurial widow disagreed. Aquaman: Origin once more altered in an attempt to consolidate the Silver Age and Post-Crisis versions. Now Arthur only threatened to be left to die on Mercy Reef by superstitious Atlanteans. Instead his mother returned him to his father's island lighthouse. Also, Atlanteans only wanted to cut out Garth's purple eyes, not kill him, so that his origin wasn't as obviously stolen by his mentor. 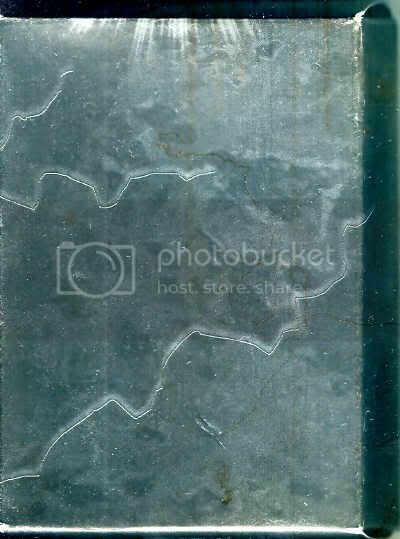 Gotham City: Alfred discovered that Bruce Wayne's grave had been desecrated. Washington D.C.: Green Lantern Hal Jordan and the Flash (Barry Allen) were at a morgue within Justice League of America headquarters designed to secure the remains of super-villains from tampering. Barry noted that in his lengthy absence, "The guilty have gotten guiltier? 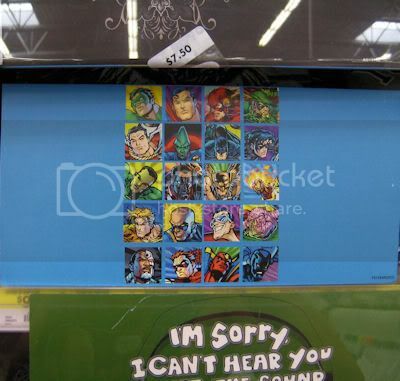 And Batman, Aquaman, and the Martian Manhunter are dead because of it? So who else? Who else died while I was gone? I need to know, Hal." A power ring construct revealed a sea of heroes gone to the great beyond, among them Elongated Man, Sue Dibny, Vibe, Steel II, others previously mentioned, and more besides. "Ronnie? Oh, no. God, please, no... not them. Not Ralph and Sue too. How, Hal? Why?" Alfred Pennyworth alerted the pair via hologram about Batman's grave robbing. St. Roch: Ray "The Atom" Palmer tried to talk Hawkman into going with him to visit his deceased ex-wife's grave. In light of Jean Loring having murdered Sue Dibny by reason of insanity, Hawkman pointedly refused. Hawkgirl tried to convince him otherwise. 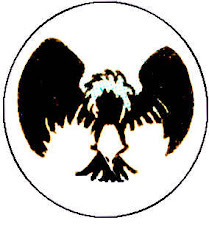 Space Sector 0: The Guardians of the Universe recognized that the war of light had erupted, a conflict amongst several agencies which derived power from the primeval color spectrum tied to emotion. The corrupt Guardian Scar then attacked her fellows, ripping out the heart of one with her hands and teeth. Black Lantern power rings rained down on Oa, pentrating the main battery, and resurrecting the copses of the Green Lantern Corps dead. Gotham City: A voice came from behind Green Lantern and the Flash at Batman's grave. "You shouldn't be back. You should both be dead." St. Roch: Just as Hawkgirl was finally admitting she loved Hawkman, a spear tore through her breast. A mace then battered the Winged Wonder. Black Lanterns Ralph and Sue Dibny: The abhorrent, ghoulish remains of the lovers had been resurrected to kill the Hawks. Sue had stabbed Kendra, while the former Elongated Man worked Katar over, physically and emotionally. "They were never as close as us. Were they, bun?" The Hawks hearts were ripped from their chests. Black Hand was also present. "You won't escape death this time. Carter Hall of Earth. Kendra Saunders of Earth. Rise. "Blackest Night" was by Geoff Johns, Ivan Reis and Oclair Albert. There was darkness. Then there was light. And the war between them began. Green Lantern Hal Jordan visited the unmarked grave of Bruce Wayne. He recalled an early day from his years in the Justice League of America, when Martian Manhunter and the rest played peacemaker between Batman and himself. Aquaman just observed, "Another reason I prefer being underwater. Less shouting." The Batman was now dead, but Barry Allen, the Flash Jordan knew best, had recently returned from beyond the veil. Joining Green Lantern in a Gotham City graveyard, Flash spoke of the breakdown in a city without its Dark Knight, and was again confronted by changes that occurred during his lengthy absence. Jordan reflected on his own demise, while under the control of the evil Parallax entity. "I died a sinner. You died a saint. Everything changed when you disappeared, Barry. The world got more dangerous. Our jobs more deadly. The Justice League wasn't untouchable anymore." Aquaman: killed after months in a mutated state toward the end of Aquaman: Sword of Atlantis. Jordan flashed back to simpler days, when he was much more cocky and optimistic, fighting Amazo alongside J'Onn J'Onzz, Aquaman, Batman, Green Arrow, Flash, the Atom, Wonder Woman, and Superman. Batman: reduced to a skeleton by Darkseid's Omega Beams during Final Night. "J'Onn J'Onzz... Martian Manhunter... he was murdered by Darkseid's followers. He's buried on Mars-- the heart and soul of the Justice League is gone." Despite their differences, Green Lantern saw Batman as a friend. Flash hoped all their old buddies would return from the grave, just as Jordan and himself had done. The pair departed. BY MY BLACK HAND-- THE DEAD SHALL RISE! The mysterious Black Lantern rose around the corpse of the Anti-Monitor on the planet Ryvt, a world once decimated by the Guardian's Manhunters. It's ultimate purpose and its creator are unknown. "Death Becomes Us" was by Geoff Johns and Ivan Reis with Oclair Albert & Rob Hunter. 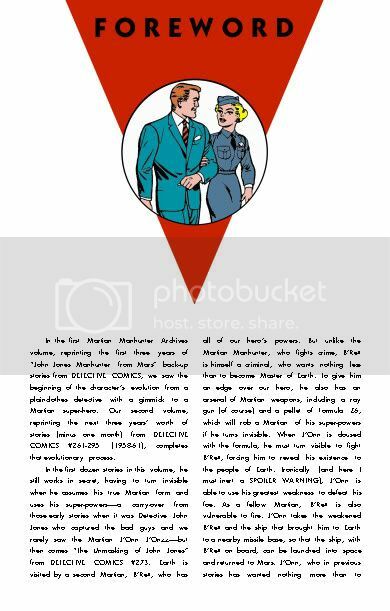 In the first Martian Manhunter Archives volume, reprinting the first three years of “John Jones Manhunter from Mars” back-up stories from DETECTIVE COMICS, we saw the beginning of the character’s evolution from a plainclothes detective with a gimmick to a Martian super-hero. 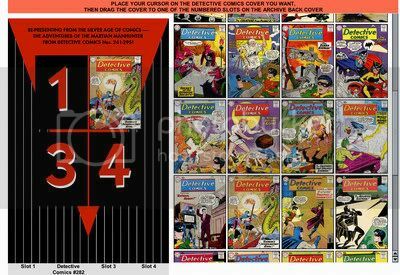 Our second volume, reprinting the next three years’ worth of stories (minus one month) from DETECTIVE COMICS #261-295 (1958-61), completes that evolutionary process. In the first dozen stories in this volume, he still works in secret, having to turn invisible when he assumes his true Martian form and uses his super-powers——a carry-over from those early stories when it was Detective John Jones who captured the bad guys and we rarely saw the Martian J’Onn J’Onzz——but then comes “The Unmasking of John Jones” from DETECTIVE COMICS #273. Earth is visited by a second Martian, B’Rett, who has all of our hero’s powers. 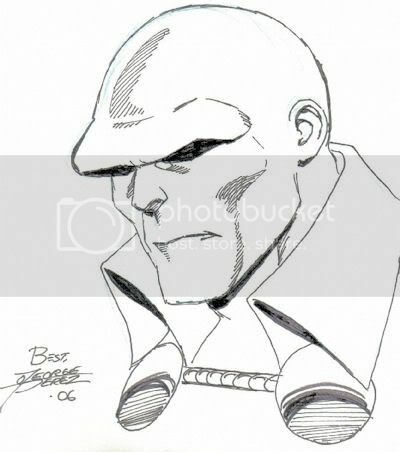 But unlike the Martian Manhunter, who fights crime, B’Rett is himself a criminal, who wants nothing less than to become Master of Earth. 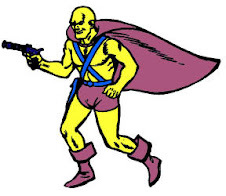 To give him an edge over our hero, he also has an arsenal of Martian weapons, including a ray gun (of course) and a pellet of Formula Z6, which will rob a Martian of his super-powers if he turns invisible. When J’Onn is doused with the formula, he must turn visible to fight B’Rett, forcing him to reveal his existence to the people of Earth. Ironically (and here I must inert a SPOILER WARNING), J’Onn is able to use his greatest weakness to defeat his foe. As a fellow Martian, B’Rett is also vulnerable to fire. J’Onn takes the weakened B’Rett and the ship that brought him to Earth to a nearby missile base, so that the ship, with B’Rett on board, can be launched into space and returned to Mars. J’Onn, who in previous stories has wanted nothing more than to return to his homeworld (see, for example, this volume’s story from DETECTIVE COMICS #267, “John Jones’ Farewell to Earth”) chooses, for reasons not given, to remain on Earth. 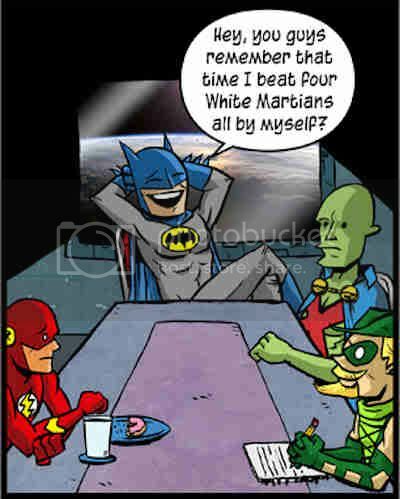 J’Onn had always kept his true identity secret because he thought Earthmen would fear his alien Martian appearance. After all, the first Earthman he met, Prof. Mark Erdel, whose teleportation device had brought J’Onn to Earth, was so startled by the Martian’s sudden appearance that he died of a heart attack. (And since it was only Erdel who could operate his invention, J’Onn was unable to return to Mars.) But fortunately, when the Martian Manhunter’s existence is finally revealed, he is welcomed by every law-abiding Earthling as a hero. Earth’s criminals feel differently, of course. By exposing himself and B’Rett to fire, J’Onn also reveals his weakness to the Earthmen who are present, but later stories, including the one in the very next issue, claim that J’Onn keeps his weakness a secret from Earthmen so that criminals can’t use it against him. In “The Human Flame” (DETECTIVE COMICS #274) a criminal named Mike (no last name given) has heard rumors that the Martian Manhunter’s weakness is fire. He dons an armored suit with built-in flame-throwers——hence the name, the Human Flame——and attacks an armored bank truck, hoping this will get the Martian Manhunter’s attention. It does, of course——nothing escapes Martian vision——and the battle ensues. 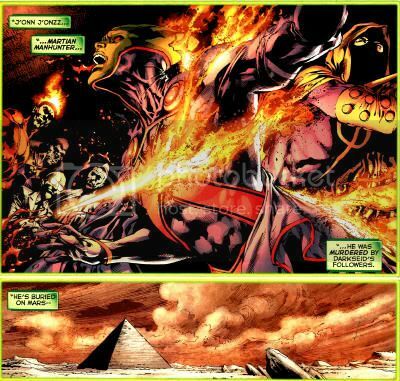 But J’Onn can’t get close to the Human Flame without revealing his weakness. This time I won’t spoil the ending for you, except to say that somehow our hero both defeats his foe and keeps his secret, so that Mike the Human Flame is left not knowing for certain if fire is indeed the Martian Manhunter’s weakness. ...J’Onn instructs Captain Harding and his men to surround the mandrills and then to each light up a cigarette. (Yes, in a scenario you would think only a tobacco lobbyist would be brazen enough to concoct, cigarettes save the Earth!) Harding and his men don’t understand why the mandrills have suddenly become weak, even though they had previously witnessed the same thing happen to the Martian criminal B’Rett when he had been exposed to fire, and had even heard J’Onn explain afterwards that fire was the weakness of all Martians. At any rate, the weakened mandrills are put back on board their rocket-ship, which is taken to a familiar nearby missile base and launched into space, to return to Mars. Once again, J’Onn remains on Earth, this time suggesting that he may someday return to Mars when his work here on Earth is done. Two issues later, in “J’Onn J’Onzz’s Kid Brother”, our hero is given yet another opportunity to return home. We find Detective John Jones in “a disguised laboratory on the other side of the city”, where he keeps Prof. Erdel’s teleportation device, the robot-brain. (Interesting that even though he’s alone in his secret laboratory, he assumes the human guise of John Jones rather than of Martian J’Onn J’Onzz.) He’s finally figured out how the thing works, and is about to transport himself back to Mars, but he trips and accidentally pushes a certain button in instead of pulling it out. Instead of returning J’Onn to Mars, the robot-brain summons another Martian to Earth: J’Onn’s kid brother, T’Omm J’Onzz. The ever-quirky robot-brain won’t allow both brothers to return to Mars together. The machine can only be used once more to transport either T’Omm or J’Onn. T’Omm wants to remain on Earth with his older brother, but J’Onn insists that T’Omm return home. But when J’Onn tries to activate the robot-brain one last time, nothing happens. As J’Onn explains, with a Martian’s sophisticated understanding of advanced technology, “The robot-brain has conked out completely!” I assume I’m not spoiling things if I reveal that J’Onn learns why the robot-brain conked out and is able to return T’Omm to Mars. And it also shouldn’t surprise you that on Mars, as on Earth, it’s not unusual for little brothers to make life difficult for big brothers. But any further details would require another spoiler warning, which I will spare you. If we didn’t know better, we might begin to think that maybe J’Onn doesn’t really want to return to Mars. Even on those rare occasions when some “accident” or “coincidence” something else suspiciously resembling self-sabotage prevents him from returning home, he makes some remark about remaining until “my work here on Earth is done” or, as he watches yet another rocket blast off to Mars, simply says nothing at all. Not that there aren’t reasons why he would want to remain on Earth. Maybe he likes being a super-hero. Maybe he likes Earthlings. Maybe there’s one Earthling in particular he likes. Things get less lonely when his battle with B’Rett forces him to reveal his true self to the world, and he’s accepted as a hero——and less lonely still when, in DETECTIVE COMICS #275, Diane Meade, her probationary period ended, has become a full-fledged uniformed police officer and is assigned to John Jones’ precinct. Since they worked so well together on their first case, she is permanently assigned to him as a partner——“John Jones’ Pesky Partner”, as the story title puts it. Why “pesky”? Because anyone as smart as her will probably figure out that John Jones, detective, and J’Onn J’Onzz, Martian Manhunter, are one and the same. Fortunately, Diane is no Lois Lane. She does have her suspicions at first, but when John finds a way to cover up his secret, she drops the subject. She doesn’t have to make it her life’s work to expose his dual identity. And our hero is no Clark Kent. Instead of feeling threatened by Diane’s inquisitiveness, John is even more attracted to her because of her intelligence and curiosity. It’s the affectionate and sympathetic portrayal of Diane Mead, and J’Onn’s obvious affection for her, that make the stories about their relationship the most enjoyable parts of this book. Even after her return, DETECTIVE COMICS editor Jack Schiff and his writers were reluctant to use her in every story. Fortunately, as we’ll see in Vol. 3, this will change. But in this volume we have only four more Diane Meade stories (from issues #282, 284, 290 and 293). We don’t need to go into a detailed synopsis of each one. What matters is that she becomes more likable with each appearances, and we begin to understand why J’Onn’s homesickness for Mars, such an important theme in the early stories, receives so little attention——often none at all——in these later stories. We know little about the life he had on Mars. We are told in the debut story, “The Strange Experient of Dr. Erdel” (DETECTIVE COMICS #225), that he worked as a scientist. (We’re not told what branch of science.) In this volume’s afforementioned “J’Onn J’Onzz’s Kid Brother” we’re introduced to his parents and younger sibling. But that’s it. Did he have a wife or a girlfriend? Did he ever find love on Mars? We don’t know, but we do know that he found it on Earth. WADE GREENBERG lives in either Middleton or Apex City with his wife, Diane, and their children, Zook and Harding. He is currently writing the novelization of the film adapted from the musical based on the '70s cult movie, Major Jones and the Spiders from Mars. 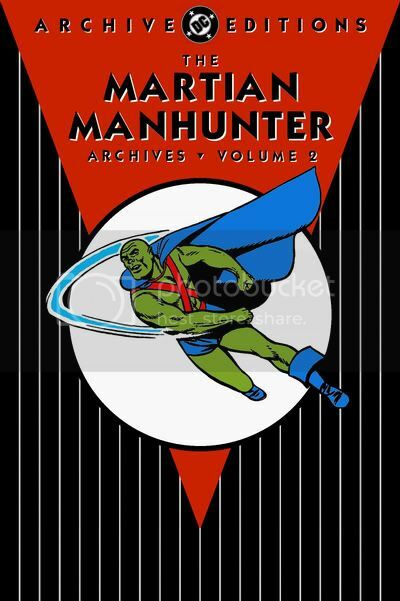 As I've done in the past, Tom scanned his copy of Showcase Presents Martian Manhunter Vol. 1, then digitally recolored it. I'm also experienced in doctoring up images to look like pages that saw print somewhere (and love the internet's giving me the opportunity to still con people a year and a half after the fact.) Where my work and Tom's differ is that his looks way, way, WAY better than anything I'll ever come up with. The coloring is attractive and credible. Artifacts aren't sloppily left unattended all over the page. The fonts are exactly the same as those used by DC Comics in these editions. Everything is centered/formatted correctly. Basically, DC could just go ahead and pay Tom a fee for his having done all the work for them on this Table of Contents, if there was a chance such a beast could ever be published. My head still spins over the Showcases, at least until I spy the Eclipso and Ambush Bug editions on my bookshelf. Talk about long shots. Anyway, you can see the TOC in its full glory as a PDF here, including one of the many swirly transformation shots of the Silver Age. 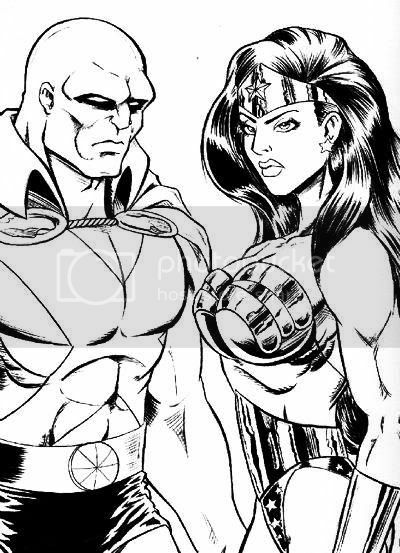 Those odd panels were J'Onn's own Wonder Woman Twirl back in the day, and you just can't appreciate what unusual eyesores they were in black and white. 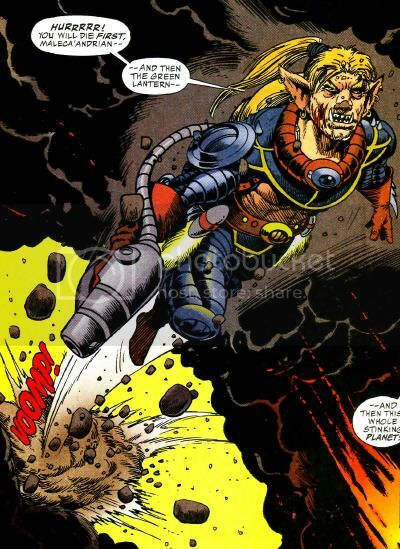 The planet Zapher had enslaved Tybalt Bak'sar's people, so he destroyed it. Eight billion inhabitants perished in an instant, including a billion of Bak'sar's own. "Better the grave than chains." Green Lantern Abin Sur prevented Tybalt Bak'sar from committing suicide, then took him into custody, earning his eternal hatred. The Guardians of the Universe sentenced Bak'sar to life in prison for his genocidal act. Unrepentant, Bak'sar swore that he would return to kill all of his enemies. After an indefinite period of incarceration, Bak'sar was visited in his cell by an emissary of the Weaponers of Qward, foes of the Guardians from the Antimatter Universe. 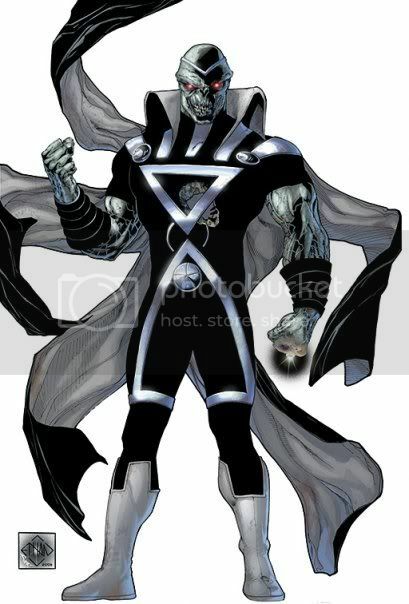 The emissary offered to aid and outfit Bak'sar in return for his acting as an agent of destruction against Oa and the Green Lantern Corps. Accepting, Tybalt Bak'sar was taken to Qward. Some time later, Tybalt Bak'sar pursued Green Lantern Abin Sur to Denver, Colorado. 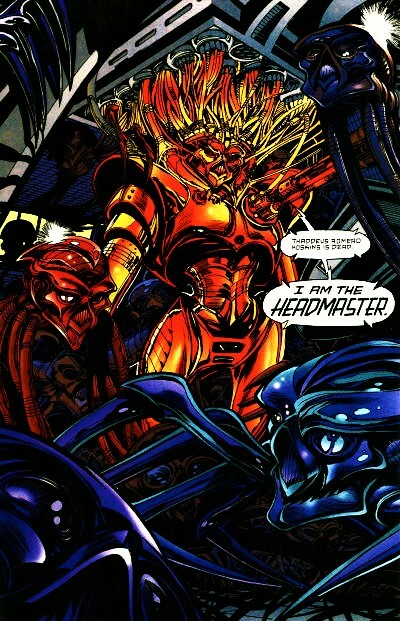 Bak'sar intended on exploiting the Corps' vulnerability to yellow energy and slaying his former captor. 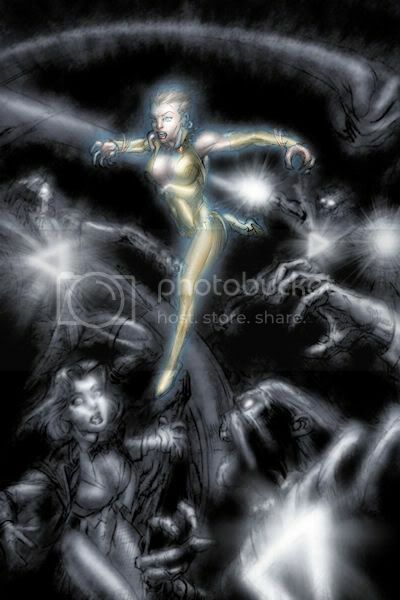 Their battle attracted the attention of the Manhunter from Mars, who attempted to break up the combatants. 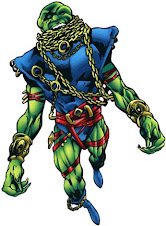 Though Bak'sar fired on the Martian Manhunter without provocation, J'Onn J'Onzz's racial distrust of the Corps clouded his judgment, and he lashed out at Abin Sur and Tybalt Bak'sar equally. From conversation, Tybalt Bak'sar learned of the the existence of Alan Scott, a non-corpsman Green Lantern. Stating his intention to kill Scott, regardless of affiliation, Tybalt Bak'sar irked Martian Manhunter. Though direct attacks were useless against an immaterial Martian, Bak'sar made use of his knowledge of the Maleca'andrian weakness to open flames. 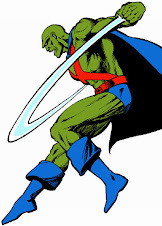 Disregarding his own safety, Abin Sur spirited J'Onn J'Onzz away in a ring construct, until his concentration was shattered. Tybalt Bak'sar practiced extraordinary rendition on Sur in hopes of clearing a path toward Green Lantern Alan Scott. Threatening the lives of the Lanterns and Earth itself, Bak'sar provoked the recovered Martian Manhunter. Finally working with the Green Lantern, Martian Manhunter managed to outmaneuver and disarm Bak'sar. J'Onn J'Onzz saw the error in his prejudice, and made peace with Abin Sur. Tybalt Bak'sar, stripped naked and carted back to Oan justice, swore he would one day slay them both. Tybalt Bak'sar is possessed of strength and durability far beyond that of a human, though its full extent is unrevealed. Based on threats made to his enemies, Bak'sar may be rather long lived. "I will see you both dead if it takes a hundred thousand years." Tybalt Bak'sar has a furry, bestial, anthropomorphic appearance. Three jagged scars streak his right cheek. Twin fangs protrude from his jaw. He has large pointed ears, and a short tail. Though he swaggers with the confidence of a zealot, Tybalt Bak'sar is utterly without regard for life of any kind. Consumed with rage, Bak'sar seeks the deaths of any who oppose him, and is implacable in his pursuit. Outfitted by the Weaponers of Qward, Tybalt Bak'sar makes use of a handgun whose lasers can penetrate Green Lantern power ring constructs. He can fly via a floating platform and belt jets. He wears resilient body armor, and carries powerful grenades. Quote: "Zaphers enslaved my people. From greatest to smallest, they benefitted from the misery of others. They deserved what they got." In a newly created origin, it was reveled that William Hand grew up in a mortuary, and from his earliest days was obsessed with death. Among his earliest hobbies was taxidermy, and he didn't let a fact like the family dog still (temporarily) being alive sway him from its aggressive pursuit. Coming into possession of an alien weapon, the necro-fanatic assumed the costumed identity the "Black Hand." After years descending from prominent Green Lantern foe to wretched joke of the super-villain community, the Black Hand returned home to murder his family. 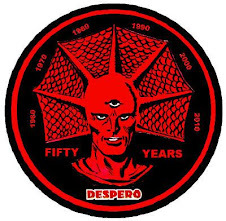 Black Hand had been "hearing" death for some time, and saw visions of the demises of many prominent DCU figures (including J'Onn J'Onzz, the co-conspirator in his murder Dr. Light, Aquaman, Batman and many more.) Hand committed suicide with his energy weapon, prompting the arrival of the corrupt Guardian of the Universe Scar. 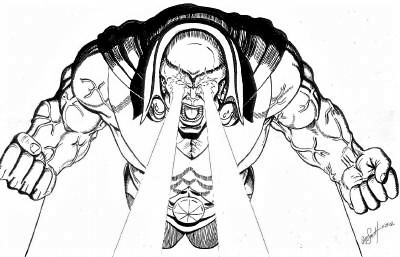 Serving at the pleasure of an unknown master, Scar vomited up a Black Lantern Power Ring. "William Hand of Earth. Rise." Black Hand was resurrected as the initial recruit of a new corps representing death itself. "Like Ion. Like Parallax. Like the Predator. You are the embodiment of our corps. You are the black incarnate. You are our lord's herald." "I... know what I am. I am the Black Hand. And with this power, I will finally extinguish the light." 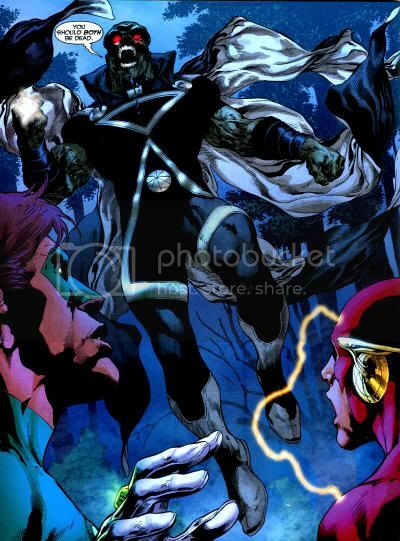 "Blackest Night Prologue: Tale of the Black Lantern" was by Geoff Johns, Doug Mahnke and Christian Alamy. 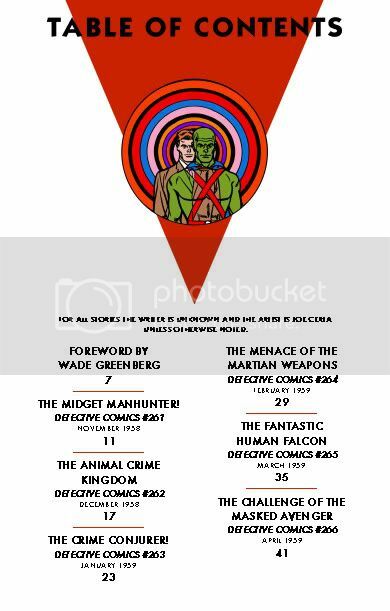 When Tom Hartley made up a back cover for his take on a fictional The Martian Manhunter Archives Volume 1, there was a little debate over how to fill the four cover spots typically showcased there. Only as I type this does it occur to me I could have helped by at least checking on the backs of the actual published Aquaman, Black Canary, Robin, or Supergirl volumes, assuming Tom hadn't already. 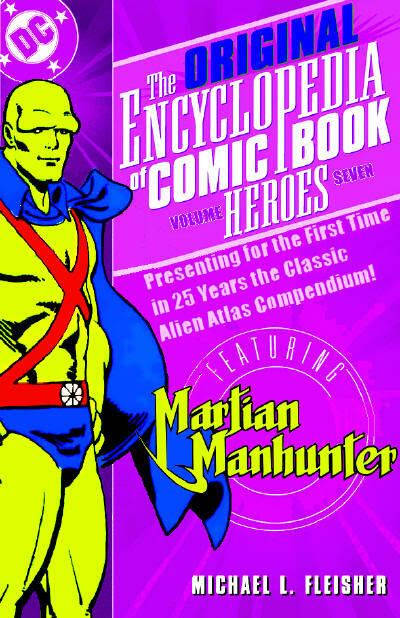 You see, like those other heroes, Martian Manhunter rarely (or in his case, never) appeared on the cover of the book whose issues were being reprinted in a given volume. 1960s British Batman Annual Covers at least made mention (or offered a small image) related to the John Jones Manhunter from Mars feature, but looking from the outside, there's no indication such a thing existed in the U.S. Detective Comics. I don't know if they used interior splash pages in those volumes or allowed the likes of Batwoman and Bat-Mite to usurp the hero a volume is meant to concentrate on. It's pretty darned cool, and browser willing, do check it out. Tom Hartley went nuts with his The Martian Manhunter Archives Volume 1 Fan Mock-Up, including creating a Back Cover, Table of Contents, and Introduction for his fantasy tome. He's stated his intention to give the same works to a five volume set of all the Silver Age Manhunter tales. This weekend, we'll look at his front and back covers for Volume Two. Tom decided this one would reprint issue numbers 261-295 of the 'Tec back-ups. Based on that, I culled advertising copy from various second Archives editions* to create the material below. After being accidentally teleported to Earth by a scientist in search of first contact with Mars, J'onn J'onzz's life changed irreversibly as he instantly went from being an alien scientist to a human-looking police detective with an incredible secret. Nearly three dozen exciting Martian Manhunter tales are included in this hefty volume, which continues the adventures of one of DC's most beloved Silver Age icons. Experience the classic villainy of the Crime Conjurer, the Human Squirrel, Mr. Moth, the fantastic Human Falcon, the menace of the Martian Mandrills, and the first appearance of the Human Flame! This Archive Edition features the Alien Atlas's public unmasking, the return of Diane Meade, J'onn J'onzz's kid brother, and much more! Reprints the John Jones Manhunter from Mars stories from DETECTIVE COMICS #261-295 (1958-61), with an introduction by Wade Greenberg! *If you're curious, it was the second Adam Strange and Atom, plus Aquaman Vol. 1. Also what's with all the foes with "human" in their name? Does J'onn secretly hate humanity after all? 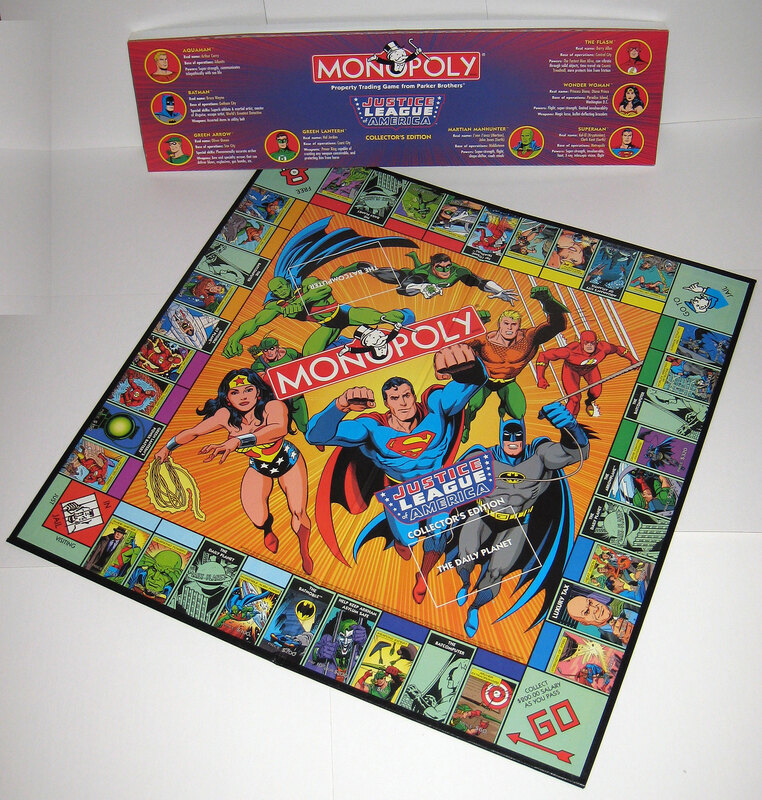 A decade back, this collector's edition version of the classic board game Monopoly caught my attention. Initially, I only ever saw it online, with few details about its guts. 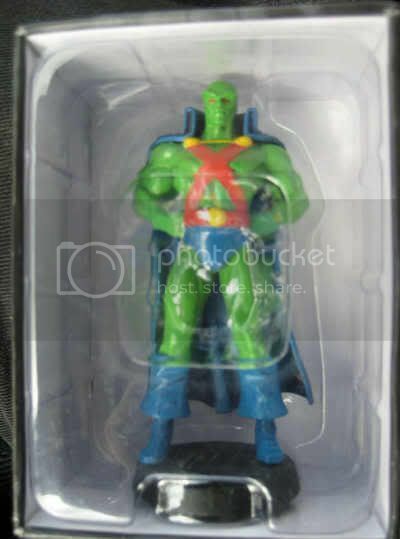 I hadn't been running my first web site long, but already I'd been rooked by plenty of purported Martian Manhunter merchandise that only featured him on the packaging, a problem to this day. I wanted the game, but I was poor, and $30.00 seemed steep. Further, I only ever physically encountered it once, and have always regretted not buying it. Along comes that beautiful hunk of man The Irredeemable Shag, who just posted an extensive article on the game, including tons of scans, at Once Upon a Geek. I highly recommend you check it out. • Exclusive reprint of the first JLA Comic Book, originally published as The Brave and the Bold #29 (March, 1960). Eight collectible pewter tokens representing the core members of the classic Justice League of America from the 1960’s. Nice Silver Age clarification there with Middletown, as opposed to the Post-Crisis revision Middleton, as in the Colorado ghost town. You can better look at the legends and the board here, courtesy of Shag. Manhunter represents all the light blue locations on the board, which in the classic game would be the Oriental, Vermont, and Connecticut Avenues. Here, they're the super powers Incredible Alien Power (Price $100,) Telepathic Powers ($100) and Shape-Shifter ($120, and featuring Detective John Jones, right next to Jail.) Per the pecking order, J'onn had the next least valuable properties after Green Arrow, and was followed by the Flash. 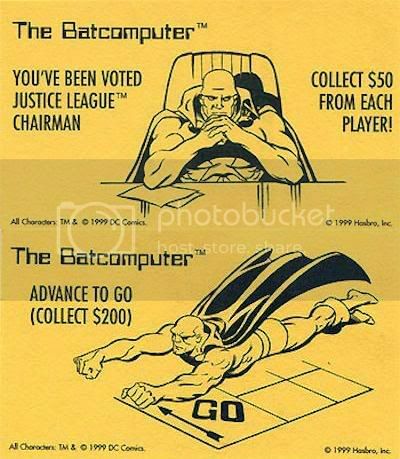 "Community Chest" became "The Batcomputer"
Chairman indeed! Per Shag, these were pretty much all of J'onn J'onzz's contributions to the game, and I think they're plenty swell. Looking at those game tokens, it makes me wish I had 12-15 hours to spare for a single game of Monopoly. Thanks again to Shag for the wonderful scans! His more expansive article is right here. I'm still sorting out old files, catching up on neglected blogs, and so on. Amongst my misplaced items was a comic strip brought to my attention by Idol-Head regular mathematicscore. Written by Curt Franklin and drawn by Chris Haley, "Let’s Be Friends Again is a comic about comics... It’s not complicated." The 10/14/09 edition involved the JLA, specifically Batman and the Martian Manhunter, and can be read here. Nice catch, M.S.! Folks have asked me a few times about my feelings regarding the Manhunter from Mars becoming an evil, hateful, undead killing machine. It seems to come as a surprise that I don't mind at all. For starters, zombies are my favorite and most feared monsters in the whole world. The Blackest Night variety favor a cross between the seriousness of Romero and cruel taunts/scheming of Raimi, two of my best loved varieties, as opposed to the also enjoyable Jackson/O'Bannon sort from Marvel Zombies. The suit designed by Van Sciver is (only somewhat) surprisingly similar to some redesigns I attempted back in the day for the Alien Atlas, and the ghostly pallor is much easier to accessorize for. The much-loved folded collar and pie symbol are back, the dopey wrist gauntlets join them, but only the Luke Cage: Hero For Hire headband* really looks out of place. It's a sharp design, and Manhunter has rarely been so prominent in a crossover, even if he is a bad guy. On that note, it's become more and more clear that this guy isn't J'Onn J'Onzz, so any shenanigans he gets up to don't count in the same was as, say, Hal Jordan as Parallax, or the latest Superman meltdown. 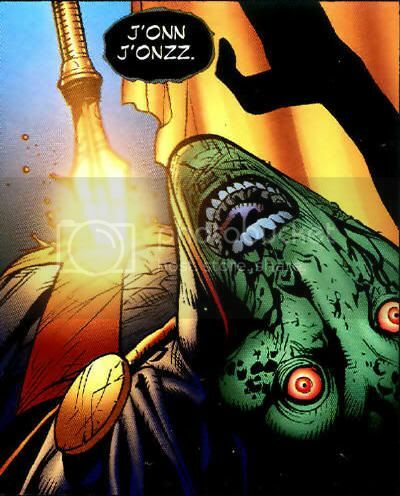 This is a reanimated corpse controlled by Nekron, not even that regressive-evil-gene nonsense from Trial By Fire, which still ended with J'Onn blasting his ancestor/evil self Fernus to oblivion. If there's no soul, there's no strike. The thing about Blackest Night is that it's pretty good, and it's written by justifiable fan-favorite Geoff Johns. Aside from editorial cluster-messes like Infinite Crisis, Johns is quite reliable, and more to the point, fairly predictable. Too many big names have already died in this crossover, and as Johns is a gent about servicing the wants of fandom, you just know a bunch of these guys will return to life and new found glory before all is said and done. It is possible, though longish odds and too soon by my measure, that a resurrected Martian Manhunter may soon be returned to us. This gets to one of my main purposes for constructing the old Rock of the JLA site, nevermind this blog: Building a better J'Onn J'Onzz. Fans and creators alike (myself included) were largely ignorant about the character's origins, history, rogue's gallery, and so forth in 1999. I always intended to help change that, and continue to strive toward a richer and more informed approach to the character. I see the Frankenstein's Monster above as the end of bad old habits regarding the Martian Marvel, and a hope for an improved model to come. We all now have access to cheap reprints of Martian Manhunter's first fifteen years of publishing, through his solo strip and Justice League of America. I've tried to cover most of the years in between Showcase Presents and the modern interpretation of the hero that began in 1987 with Justice League International. I've also tried to shine a light on hidden gems to the present, and will endeavor to continue, as there is so much more to offer. The point being, to anyone offended by Black Lantern Martian Manhunter, give some consideration to where to go from here, and how to insure we never endure a disposable J'Onn J'Onzz again. Anyway, a negative and bisected version of the above image was used as a teaser ad for Blackest Night. A full color version was seen on the convention circuit this year, but this smallish jpeg is all I can find on the internet. If anyone can direct me to a higher resolution option, I'm all ears! *Check the comments for EVS' explainin' thet thar tiara thingee! Still not 100% on this, but with details "top secret" and everything centering here, Black Lantern Martian Manhunter readers should be on this. The JLA t escape the BLACKEST NIGHT! Faced with the continuing threat of the Black Lanterns, Zatanna, Vixen and the rest of the team confront their pasts when fallen friends and foes return for blood! Though partially obscured, this seems very likely to be the debut of Nekron's Justice League Detroit. 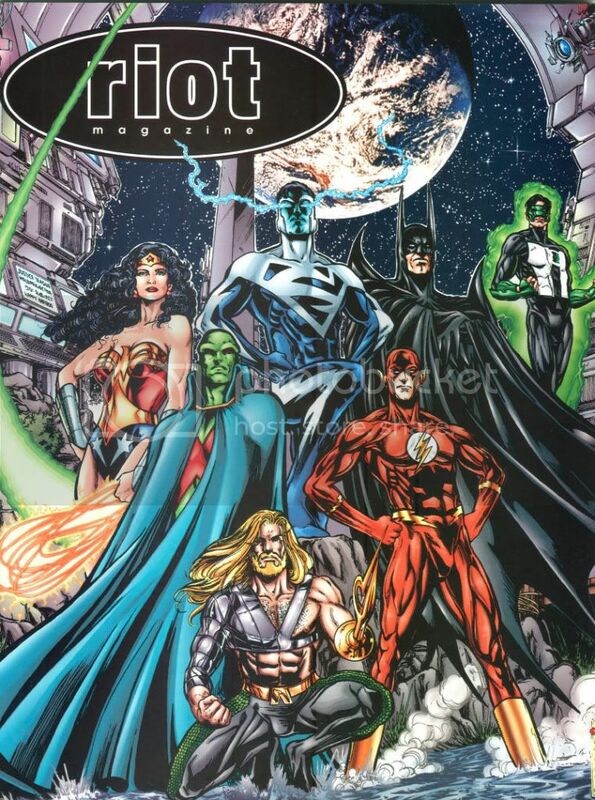 Black Lanterns Vibe, Steel II, Elongated Man, Sue Dibney, and hopefully Aquaman and Martian Manhunter vs. surviving members Zatanna and Vixen. Who would have ever thought those would be the last two living, by the way? Also, I hesitate to ask, what of poor Gypsy? Whose side, if any, will she be on? A grim J'Onn J'Onzz fantastically rendered by the master himself! 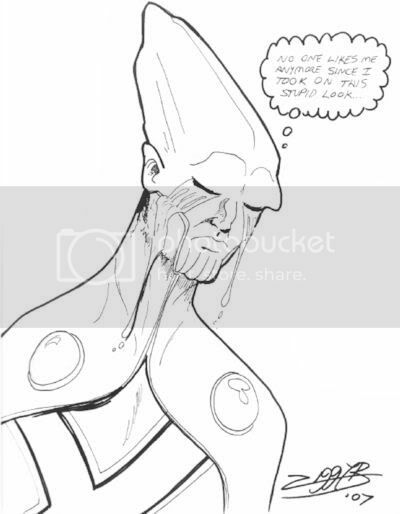 As this has been a topic of interest in the comments for a week now, it seemed appropriate to offer up this piece, featuring the Conehead/Pickle/Pinhead redesign Martian Manhunter weeping over what his new look hath wrought. This comes from Wizard World Philadelphia and the pen of Ziggy Blumenthal, whose work can be found at Fake McCoy Comics. A pin-up by Buddy Prince. 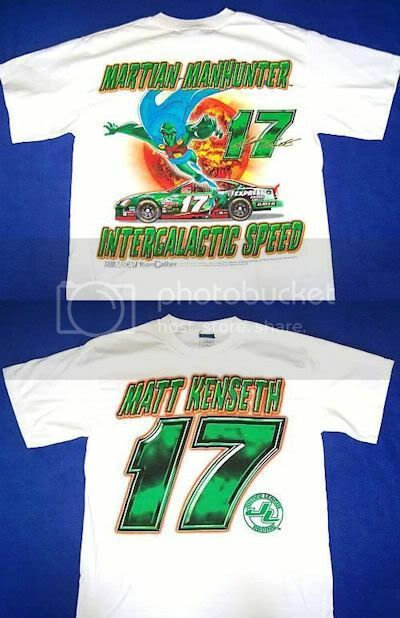 These appear regularly on eBay, starting at $3.00. 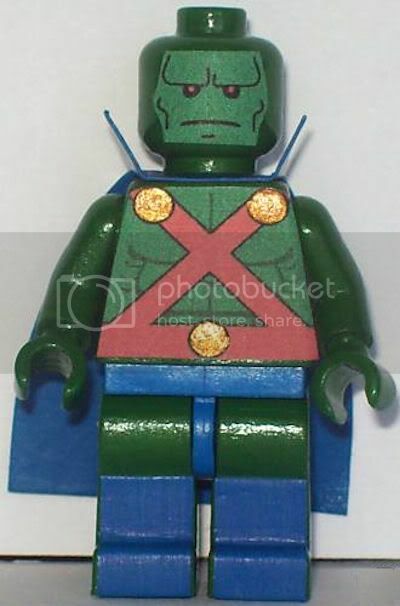 The currently running eBay auction describes this as a "Custom Lego Batman friend and Justice League member Martian Manhunter." It's served "freshfromthesewers" at a starting bid of $5.99. Wizard Magazine and Marvel Comics' Ben Morse, blogger at The Cool Kids Table, tells the story of how his fiancé partially inspired the creation of Megan Morse/M'gann M'orzz in his post The Secret Origin of Miss Martian. 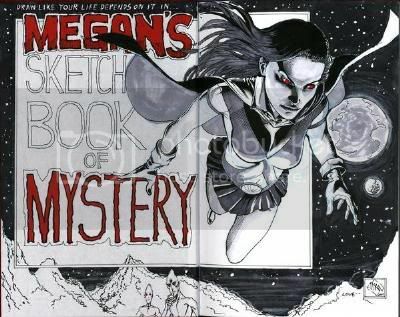 You can read more about that by following the links, but as an added bonus, Morse offered this first entry in his wife's Miss Martian sketchbook. Over two pages, Ethan Van Sciver set a high bar for all that would follow, and gave us some nice natural form Green Martians besides! 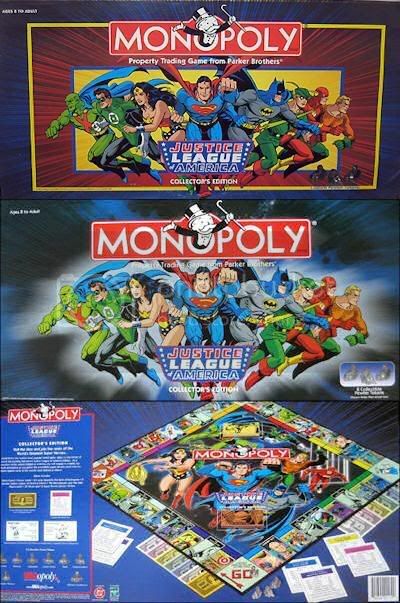 I mentioned the 1967 Justice League of America Wonder Woman Game a few months back, and alluded to there being two more besides. 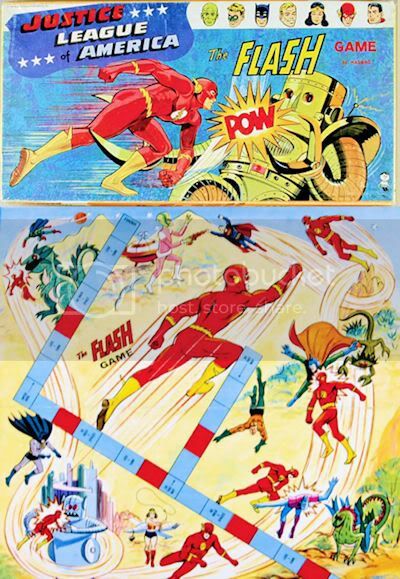 Well, here's the second helping, a board game starring the Scarlet Speedster. 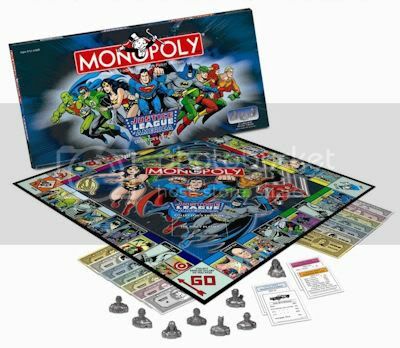 Once again, J'onn J'onzz's head appears on the box top, this time alongside a blond Green Lantern Hal Jordan, plus Batman, Aquaman, Wonder Woman and Superman. Besides the mistakenly red cavaliers like last time, the Manhunter from Mars now sports matching gloves. The shame of it! Anyway, J'onn joins Barry Allen in battering a silly looking dragon. I don't know anything about the games mechanics, so we'll leave it at that. 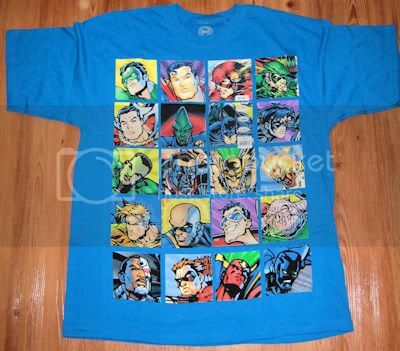 Besides its being hit and miss on characters and kind of funky looking, I avoided buying the DC Comics Originals TS136450 DCCOMNT15 Turq T-Shirt because if I had, I'd never have gotten back in to Wall-Mart to photograph this novelty. It's a thin cardboard display intended to be slid into a clear plastic sheath to designate the shelf locations for these ugly shirts. I'd guesstimate it measured about 4" tall and about 7" across with a plain white back. 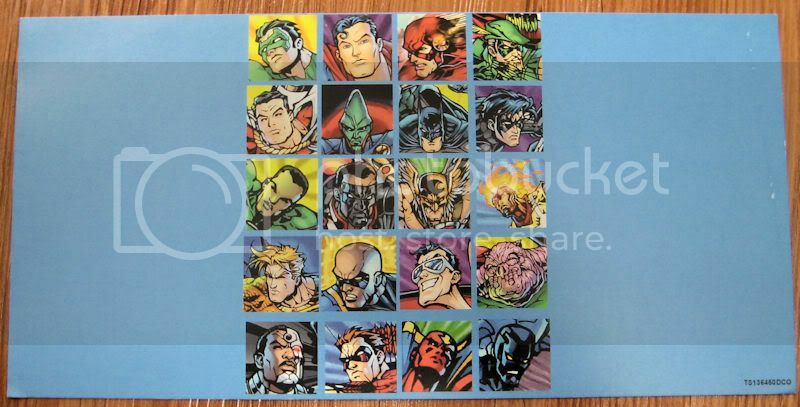 R to L: Green Lantern Kyle Rayner, Superman, the Flash, Green Arrow, Captain Marvel, conehead Martian Manhunter, Batman, Nightwing, Green Lantern John Stewart, Mr. Terrific, Hawkman, Firestorm, Aquaman, Black Lightning, Plastic Man, Kilowog, Cyborg, Red Arrow, Red Tornado and Blue Beetle. The ultimate collection for comics fans, the DC Superhero Collection Figurine Magazine brings together DC Comics` greatest heroes and villains! 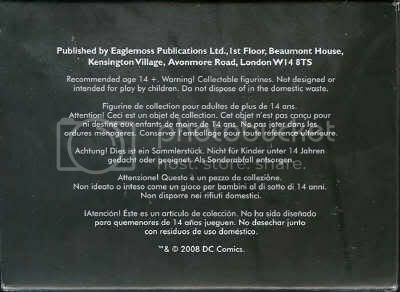 Official figurines of the characters, both good and evil, are cast in lead, individually hand-painted and numbered to form an authentic collector`s edition. Each comes with a 20-page magazine providing detailed history and background on the featured characters, including exclusive images and interviews. Choose this month from Starfire (#17), the Martian Manhunter (#18), Hitman (#36), and Batgirl (#37). I finally received my order (at $11.20) for this collectible on Tuesday, which I assume arrived stateside earlier than scheduled-- roughly September. By my calculations, it would have originally been released in mid-December of last year in Europe. Blessedly, I'm a reader, so the unlikelihood of getting this package in anything resembling mint condition was never a concern for me. The twenty page (counting covers and ads) magazine-sized booklet shipped in a hand-taped polybag with the figurine, so enormous creases in the cardstock cover were to be expected. The heavy figurine (guesstimation: 20 oz.) is itself encased in a two piece sculpted plastic clamshell, then everything is taped together in an open-faced cardboard box. In this post is a hasty digital photo I took of the complete package, then scans of the box. 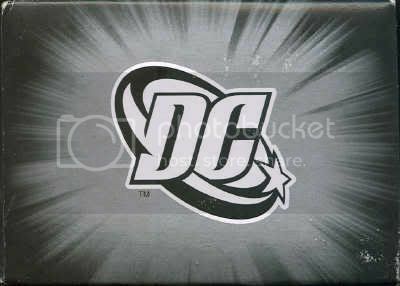 The top sports a modern DC Comics logo emitting gray light. Gray-white electrical currents cover the back and sides of the box, while the bottom includes copyright information and other relevant text in several languages. This weekend, we'll further explore this collectible figure and magazine. 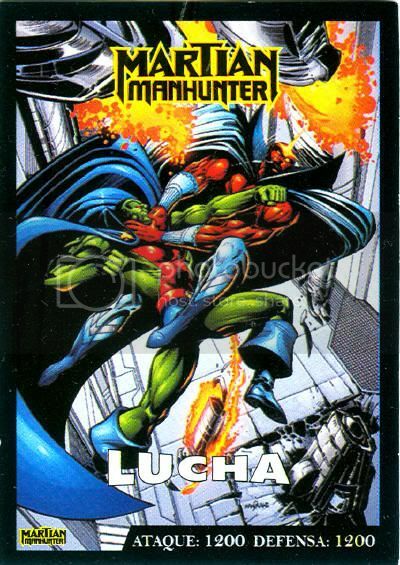 2007 Alfajor Maxi Max Cookies DC Super Heroes Cartas De Poder: Martian Manhunter "Lucha"
...and here's that other Argentine cookie company gaming card, "Lucha," which means fighting or "wrestling." In this case, it's with Jemm: Son of Saturn, a problem Superman looks to be facing this week. 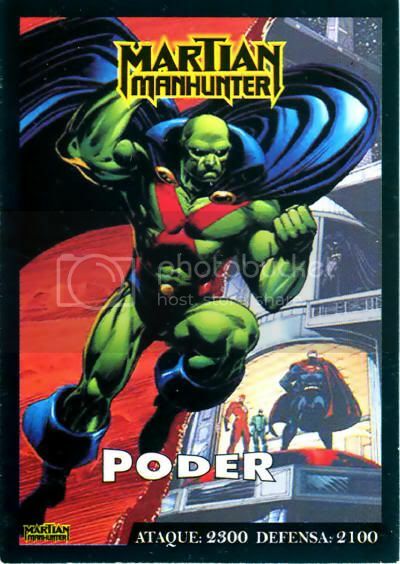 The image is by Tom Mandrake, from the cover to March 1999's Martian Manhunter #4. The Attack value is 1200, with a Defense of 1200, making it weaker in both categories than "Poder." Working on other projects and running behind tonight, so here's a quickie. 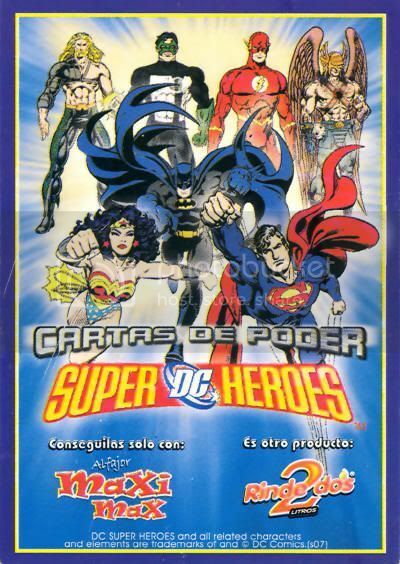 2007 Alfajor Maxi Max Cookies DC Super Heroes Cartas De Poder: Martian Manhunter "Poder"
I always knew eBay was a great source for posting material, but in my time away forgot about the overwhelming likelihood that visiting will compel me to buy random weird junk. 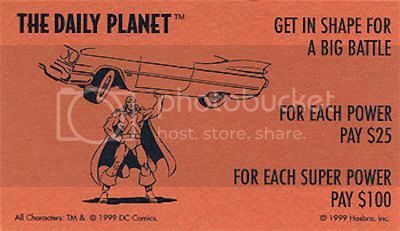 For instance, how often do Argentine gaming cards featuring J'Onn J'Onzz come your way, so why not pick them up on the sorta cheap, right? So here is my first of two DC Super Heroes "Cards of Power." In fact, this very card is all about "Poder," or "Power," It features a Tom Mandrake image, that was either used for advertisements or in an early issue of the ongoing series (I can't readily recall which.) It appears to show the Manhunter on Mars, but it seems like the JLA Watchtower is in the background (or was that Z'onn Z'orr?) Inside the building are Superman, Flash, and Green Lantern Kyle Rayner. I know nothing about the game, but the card has an attack value of 2300 and a defense of 2100. "J'Onn J'Onzz from THE NEW FRONTIER"
2008 "Martian Manhunter Riding A Unicorn"
2010 "DC Ultra Spread C"
2007 "10 Minute Sketch: Martian Manhunter"
2008 "The League: Past & Present"